It can't get better than this, this February on Glambeaute.com! Spin the wheel, crazy deals, and special personalized gift cards - these are just some of the best Valentine's Day offers available on Glambeaute.com, the one-stop online shop for all your beauty needs! Glambeaute.com is out to make Valentine's shopping fun and exciting for everyone. It's a whole month of offers, and there's a chance for everyone to participate and win. 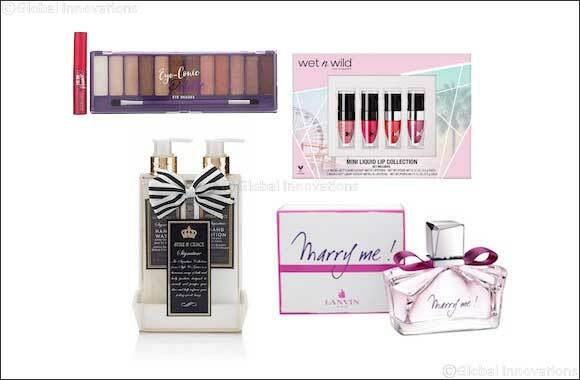 Shoppers can enjoy deal-of-the-day perfume offers throughout the month and a fun Valentine's Day themed spin-the- wheel for chances to win some great beauty prizes and discounts. If you're looking for the perfect beauty gift, you can opt for a personalized gift card specially introduced on the website so that your Valentine can have the same experience as you on Glambeaute.com. Here are a few beauty and grooming essentials to get Valentine's Day ready that could also make for great gifting options! This luxury hand care set is designed to nourish and pamper delicate skin and help improve feelings of well-being. The evocative fine fragrance and nourishing ingredients leave hands feeling soft and hydrated. For a romantic and spontaneous woman. Lanvin has imagined a romantic and sensual fragrance, an essence of light-heartedness intended for all who love to feel in love. Be kiss-ready with Wet n wild's long-lasting lip set. Containing 2 matte and 2 metallic colours, it features dynamic pigments that appear to change with light. Offering intense pigmentation, these minis have a comfortable finish, without drying the lips. If her eyes do all the talking then the Eye-Conic Palette is perfect for her! It features 12 complementary festive shades to take her look from Soft Focus and dreamy to Hi-def and dramatic. Perfect for every day wear and date nights! Glambeaute.com stocks a selectin of Gabru beard oils. The brand's special blend of natural oils helps condition the beard as well as soothe & calm the skin beneath. Timeless and classic, this aromatic fougere fragrance has been the staple of any gentleman since 1990. The luxurious fragrance radiates seduction on every level. An alluring EDT that never fails to mesmerize. The composition is defined by woody, aromatic, fougere notes. The scent embodies seduction and makes an eloquent signature.